Jim Harkey Memorial Fund is the philanthropic arm of NARI Charlotte, in memory of one of our early leaders, and consistent with his commitment to those in need. In addition to providing assistance to NARI families in need, we support local non-profits and local chapters of national organizations. We also offer industry and general scholarships to NARI members and family. In 2018 we granted 4 scholarships in the amount of $1,250.00 and 1 for $2,000.00. 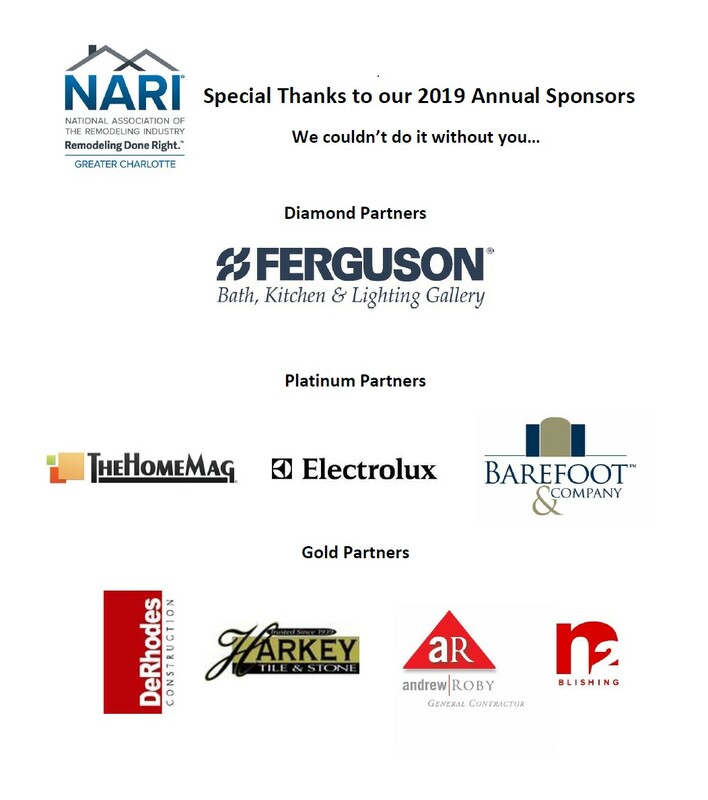 These scholarships are designed for NARI of Greater Charlotte members and their children, to provide partial funding to high school students or industry professionals wanting to advance their education at a technical trade school or two or four-year nationally accredited college. Scholarship funds will be distributed at $500.00 per semester and can only be used for tuition, and books. To apply for this yearly scholarship, students are to complete the required forms and provide the materials to the NARI Jim Harkey executive board no later than one (1) semester before the semester they are requesting funding. The Board of Directors of the NARI Jim Harkey Memorial Inc. may also elect to provide scholarship grants to local community and vocational schools. The students who apply for this scholarship must have a high school diploma with a weighted grade point average (GPA) of at least 2.6 or equivalent or a GED. The students must formally apply when they are candidates at a technical trade school; two or four year nationally accredited college or university. Full time students in the reapplication process must reapply yearly and be enrolled in full time classes during the reapplication procedure. A NARI member can nominate the scholarship applicant. The first consideration for applicants is NARI member employees or families. All high school seniors must have a documented overall weighted 2.6 academic GPA upon graduating high school. The current GPA documentation must be attached to the scholarship application. Currently enrolled students must maintain an academic 2.6 GPA post-secondary overall while attending all programs. All applying high school graduating seniors must complete the required paperwork and bring the paperwork to the NARI Jim Harkey Fund Inc. board of directors. Students who receive this scholarship are required to attend the meeting they are to receive the scholarship certificate and are required to send grade reports to the chapter every semester documenting their academic progress. The application must be completed and submitted by the student. One letter of recommendation from a teacher, school administrator, or immediate supervisor, is required to accompany the application. The letter must state why the student should be considered as a candidate for the NARI Jim Harkey Scholarship program. The student is also required to write an essay with a minimum of 250 words or a maximum of 500 words describing why they should be considered as a recipient of the NARI scholarship. All decisions by the selection committee are final and the Board of Directors of NARI Jim Harkey Memorial Inc. approves all scholarships. The schedule for review and distribution is as follows: Applications for the scholarship are available beginning March 1st. All applications are due to the selection in May (date to be announced). All applications are reviewed and selected by the selection committee in June. Board review and approval is at the June Board meeting. Scholarship awards are announced and disseminated at the June meeting. Funds will made payable directly to the institution.